Liberia's President Ellen Johnson Sirleaf attends a news conference at the Presidential Palace in Monrovia, Liberia, Oct. 12, 2017. Liberian President Ellen Johnson Sirleaf's spokesman on Monday denied allegations from her own party that she meddled in this month's presidential election. The dispute has cemented a falling out between Johnson Sirleaf, a Nobel Peace Prize laureate, and her party's leadership after 12 years in power that saw the country consolidate a post-war peace but draw sharp criticism over alleged corruption and underdevelopment. At a news conference on Sunday, leaders from Johnson Sirleaf's Unity Party accused the president of holding inappropriate private meetings with election magistrates before the Oct. 10 vote. They accused her of showing greed "in its most callous form" with the "intent of disrupting the fragile peace of Liberia," and backed a challenge to the first-round results brought by other parties before the country's election commission. 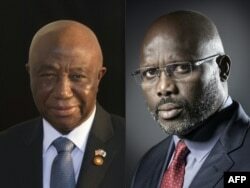 Unity Party's candidate, Vice President Joseph Boakai, placed runner-up in the first round with 28.8 percent of the vote to front-runner George Weah's 38.4 percent, setting up a second-round run-off scheduled for Nov. 7. This combination of pictures created Oct. 16, 2017 shows, at left, Liberia's Vice President Joseph Boakai on Aug. 5, 2014, and former football player and candidate in Liberia's presidential elections, George Weah, Sept. 25, 2017. "The office of the president wishes to state unequivocally that these allegations are completely baseless and an unfortunate attempt by agents provocateurs to undermine Liberia's democratic process," Johnson Sirleaf's spokesman, Jerolinmek Piah, told reporters. He said that all of the president's meetings with election officials were "consistent with her constitutional role to ensure that the process was supported." "These allegations fall in the category of hate speech and inciting language which should be condemned by all peace-loving Liberians," Piah added. Liberia's economy has quadrupled under Johnson Sirleaf's watch, but the forested country remains impoverished and many have no access to reliable drinking water and electricity. Tired of the monied elite that they say Johnson Sirleaf represents, many voters see Weah as the candidate for change. Boakai has served as Johnson Sirleaf's vice president since her inauguration in 2006, but Johnson Sirleaf declined to endorse him and he distanced himself from the last administration. The election commission was expected on Monday to hear the challenge to the first-round results brought by the Liberty Party of third-place candidate Charles Brumskine, with the backing of Unity Party and the All Liberian Party of businessman Benoni Urey.